Chipping Norton trainer Charlie Longsdon has been delighted with the way Vivas has taken to fences. The Hull Farm handler saddled Vivas to win at Doncaster on Saturday. The seven-year-old won the Rock Civil Engineering Ltd Handicap Chase, partnered by Paul O’Brien, which took the yard on to 22 winners for the campaign. It was a third win from four starts over the bigger obstacles for Vivas and Longsdon said: “Vivas has enjoyed going over fences this season despite only being little and brought his tally up to three at Doncaster on Saturday. Paul [O’Brien] gave him a great ride to make sure he always had something to aim at before drawing clear of his rivals. 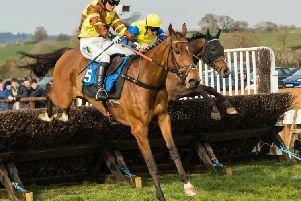 Copperfacejack landed the spoils for Mollington trainer Paul Webber at Hereford on Wednesday. The eight-year-old won the Dreams Of Sri Lanka Handicap Chase in the hands of Tom O’Brien.